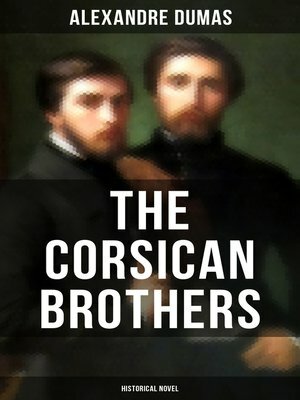 The Corsican Brothers tells the story of two conjoined brothers who, though separated at birth, can still feel each other's pains. The story starts in March 1841, when the narrator travels to Corsica and stays at the home of the widow Savilia de Franchi who lives near Olmeto and Sullacaro. She is a mother of a former conjoined twin, Louis and Lucien. Louis is a lawyer in Paris, while Lucien clings on to his Corsican roots and thus stays at his mother's home. The narrator learns that the brothers were once conjoined, but separated at birth by a doctor with his scalpel. Despite being separated Louis and Lucien can still feel each other's emotions, even at distance. Lucien explains he has a mission to undertake, with reluctance. He has to mediate in a vendetta between the Orlandi and Colona families and invites the narrator to accompany him and meet the head of the Orlandi family. Alexandre Dumas, père (1802-1870) was a French writer whose works have been translated into nearly 100 languages and he is one of the most widely read French authors. His most famous works are The Count of Monte Cristo and The Three Musketeers.